The letter our family dreaded finally arrived. 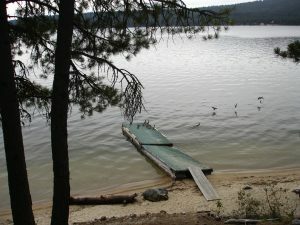 The Parks Department of the State of Idaho terminated our lease in Ponderosa State Park on Payette Lakes. Seventy-five years ago, in 1943, our grandmother bought this cabin on the lake from the local theater owner, situated on land leased from the Idaho Department of Lands. The cabin had no electricity, no water, no fireplace, and it stood on rocks with no foundation. My grandfather and two of my mother’s cousins added on a concrete and brick fireplace and chimney. We all used kerosene lamps until electricity wired from the dirt road brought us light. 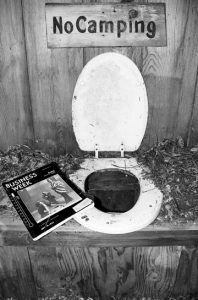 The outhouse along a forest path served other needs. Grandmother Elsie dipped her bucket into the lake on early cabin mornings and brought it up the wood ramp for our use, or the men in the family poured water from spigots at the Nazarene Camp next door and carried the heavy buckets to the cabin. They rested on the counter in the kitchen, a long handled drinking dipper hanging from a hook nearby. We all swam in the pristine lake, always keeping an eye out for the rumored sea monster named Sharlie. The white sand beach and a few driftwood logs set the scene for sand castles, models wearing towels as hats or gowns strutting back and forth, searches for discarded snakeskins, and “meals” placed on plates and utensils carved by our grandfather, where he sat in the shade of two pine trees. My father played the monster and chased us up and down the beach, he growling and we screeching. Our family came in August. My uncle’s family joined us part of the time, but also spent other days and weeks because they lived in Boise. Six cousins and six adults with my grandparents. We all squeezed in. The kitchen floor in the cabin sagged. The steep steps to the bedroom loft grew steeper as we aged. Each of us contributed sheets, towels and blankets, but the best were Grandmother’s quilts, especially warm and cozy on cold nights. New linoleum eventually brightened the main living area and kitchen. My mother, our family’s matriarch after my grandparents and my father passed, insisted a bathroom be added to the screened-in porch. My uncle brought water from the camp via pipe extension and the McCall sewer district added our cabin to its system. I first visited in 1945 at two years old. My annual visits ended when I left home for college, but began again from Seattle where I lived and practiced law. My mother lasted to 96+ years, still visiting every year—her favorite place in the world. 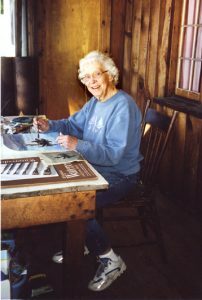 She and I spent time there every September (almost) for ten to eleven years from 2001 to 2011, a time for her to paint and I to write. 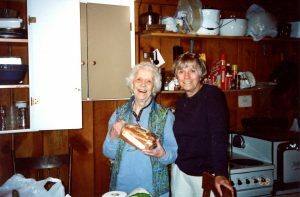 My cousins often joined us to visit, to eat, to sew, and to share our love for the cabin. Now, the Park wants our space. They will scrape our much loved cabin. My cousins work to save precious reminders of our sojourns there. Antique dealers bought the round oak table and upright chairs, the Hotpoint stove, the Kelvinator refrigerator, some of the dishes and framed pictures, and an iron bedstead. I doubt anyone wants the paintings we all made on slabs of wood to decorate the outhouse. 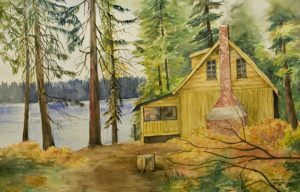 A painting by my mother of the former log mill on the lake is saved by my sister. A cousin wants the windows and double Dutch door. I remember the strong scent of sun on dust, of ponderosa pine sap and snow brush on the slope to the lake. 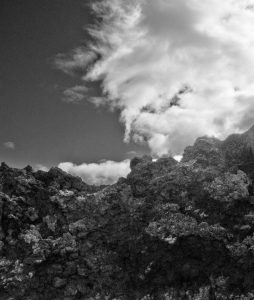 I remember the quiet slip, slip of water on the beach in the morning and the boom of white capped waves in a storm. I remember the sound of rain on the tin roof, so loud it woke us up. I remember thunder and lightning and the fear that a giant tree would fall on us, but finally the steady rhythm on the roof would send me back to my dreams. 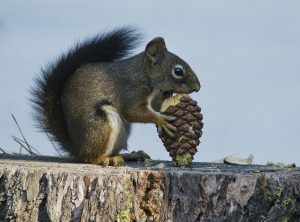 I remember sleepy afternoons on the bolster at the end of the porch, the quiet brush brush of a breeze in the pine needles, the chatter of squirrels as they gathered pine cones for winter. I remember the deer, fox, and bear that appeared and poked around the cabin. I remember gathering huckleberries in early August in small silver buckets, eating as many as I plunked into the buckets. I remember the pies my mother and grandmother made from the huckleberries, and those of my husband who succeeded the women in pie-baking. I remember playing with paper dolls on the cabin floor, drawing new clothes and sharing the time with my cousins. I remember my grandfather rising early to light the fire in the cook stove and fireplace and my grandmother pasting matchbooks covers on a card table. I remember the base of the tilting ponderosa pine where my sister and I played with our dolls. I remember lying on the tilted dock on my towel, searching for streaking lights during the Perseid m eteor shower. I remember holding m y mother’s hand as we talked about what comes next. I remember the mergansers on the dock and the osprey chirping and diving for fish. I remember a place where I was cradled, free to pretend, to write, to think, to sink into a well-loved structure, soon to disappear and remain only in my memory. MOONSCAPE, a new Nellie Burns and Moonshine Mystery, will be published in June, 2019! The publisher, Five Star Publishing, is even now working on the cover and preparing the Advanced Reading Copies (proofs). 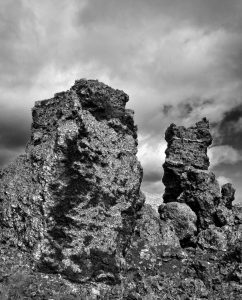 We sent some of Gerry’s photographs of Craters of the Moon to be considered. Just to get you in the mood, here are a few! 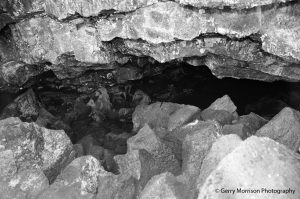 The caves figure prominently in the story. 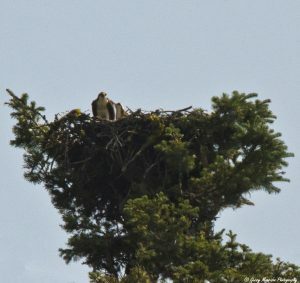 This entry was posted in Uncategorized and tagged Boise, cabin, Gerry, Hotpoint stove, Idaho, McCall, mergansers, osprey, outhouse, Payette Lakes, Sharlie the sea monster by JulieWeston. Bookmark the permalink. Julie – how lucky you and your family were to have a place to go and be with family. I was lucky in that too. When I was 10 years old we moved from Denver to Mtn. View CA and we began to rent cabins in Yosemite. After about two years of rentals my parents bought a shell of a cabin on the other side of the Merced River and my dad proceeded to spend almost every weekend and his 2 week summer vacation adding knotty pine walls, bunk beds, built-in dressers, a day bed, decks, kitchen and bathroom cabinets, tile work and on and on. He was obsessed. It still stands in almost original condition which in a way is not good. 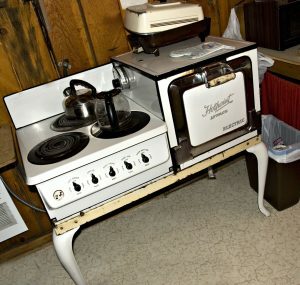 The coffee pot wallpaper still lines the kitchen walls and after almost 60 years looks grimy from photos I see on the internet. Likewise the bathroom wallpaper. It all needs paint and a very good cleaning. It is a rental now and comments are usually that it is dated. Of course it is! It has not been touched since my parents sold it many years ago. But all the beautiful bones are still there – the woodwork, the stone fireplace with the heart shaped stone in the middle, all the built in furniture. The outhouse we used for the first few years is gone though. The saddest thing is that so many of the trees are gone, fallen victim to the bark beetle. But my sisters and I and my children still have wonderful memories of sleeping out on the deck, chasing a raccoon from the kitchen garbage full of spare rib bones, swimming in the cold Merced River, taking bear walks at night, the Meadow Loop walk that was a requirement of every visit. All of that is dearly missed but not forgotten. Your cabin sounds so much like ours, Susan. Thanks for sharing your experience. Yes, I already miss our cabin–just the thought at the moment–but so glad we went this summer before we learned the Parks Dept was cancelling our lease. Sadly, an era is ending. You have the memories and they will sustain you. My grandparents had a beach cabin in Southern California where the family met for summer stays and sunburns. Trust me, you will visit your cabin a million times over the rest of your life. Thanks for the lovely blog. You were lucky to experience what you did. As for recommendations, anything by WWW authors Susan Tweit and Mary Trimble are mind vacations for me. 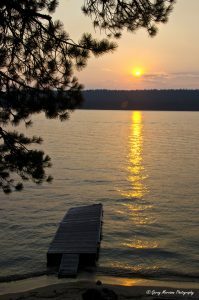 Yes, I was indeed lucky to have so many years at our McCall cabin. Thanks for your suggestions, Anne. I agree, both Susan Tweit and Mary Trimble are favorites of mine, too. Your recollections of the cabin you have cherished all your life brought tears to my eyes. 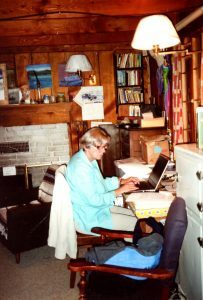 You brought the cabin back to life with your writing. We are now all sharing it with you through your vivid descriptions of the connections you made with nature, the lake and just being in the outdoors. Thanks for brightening a gloomy day! Thank you, Karren. I so appreciate your thoughts and reaction. Such a wonderful place perhaps inspired me. We can continue in the outdoors, so that is not lost. I, too, choked up reading your beautiful account of days at your family’s cabin. What wonderful times to have had, what special memories to hold. Thank you, Irene! So nice to hear from you! I am pleased my story of our cabin resonated with you. See you soon! Florence Blanchard suggested Half of a Yellow Sun by Chimamanda Ngozi Adichie; Solar Storms (fiction) by Linda Hogan; Strangers Devour the Land (nonfiction) by Boyce Richardson. I can see that my to-be-read stack is going to grow ever higher. I have a suggestion for your travel book list. The book is: Half A World Away. It is a first effort by my son, Mike Moe. It can be found as an eBook on Amazon. He drew from his experience as a travel guide in South America, so it is very realistic. This book is a must-read for anyone (especially a young person) who wants to travel independently, but has a little trepidation about jumping into the budget travel scene.